Ryan Kramer is a student at UNC Chapel Hill, where he is pursuing his B.A. in Philosophy with minors in Chemistry and Biology. After graduation, he plans to earn his MD and Masters in Bioethics through a dual degree program. Eventually, he hopes to research bioethics and health policy while practicing as a pediatric specialist. In the following article, Ryan explains what makes the study of genetics different from other disciplines and provides tips for mastering the subject material. Genetics: G, T, C, but how do you get the A? Sometimes it feels like there’s DN-o way (last pun, I promise). After working on my university’s genetics teaching team, I’ve accumulated some tips for learning the subject. In this article, I’m going to explain what’s different about genetics (and why it’s so hard to master). Then, I will discuss how you can best succeed. In high school, biology required a lot of rote learning. For example, we repeated “the mitochondria is the powerhouse of the cell” until we knew it cold. We memorized the chambers of the heart, the organelles and their function, and the fact that DNA encodes genetic information. However, this reliance on memorization disappears in collegiate biology, and especially in genetics. Another aspect of genetics that is fairly unique is its emphasis on application and connection. As Dr. Tony Griffiths presented at the International Congress of Genetics, the subject requires extensive problem solving. Many students understand what is said in class, but struggle on the exam. Why? In class, the professor explains each answer, luring some students into a false sense of confidence. “I understood exactly what the professor was saying, so I’ll be fine on the exam,” you might think to yourself. While it’s great that you understand what’s taught in class, keep in mind that problems are usually comprehensible when they’re explained; it’s much harder to solve them yourself. If your professor explains the rationale for an answer, it will seem intuitive. It is an entirely different matter to create your own rationale, and that is what you have to do on exams. Another aspect of genetics that is fairly unique is its emphasis on application and connection. Many of my favorite questions begin with “On an alien planet….” The idea is that, to understand genetics, you need to be able to apply it. This is why passively listening in class doesn’t cut it; it’s vital to not only know what was discovered, but how it was discovered and proven. This type of scientific thinking will allow you to do well in class, and moreover, to be a better critical thinker and future doctor. Bloom’s Taxonomy is a new and widely-accepted theory in education. According to it, many of us are experienced in the “remember” category: memorizing, defining, etc. “Apply,” however, is two levels above. Just above application is “analyze” (drawing connections). Below both is “understanding”; this is why simply understanding what is said in class is insufficient. In order to perform well on an exam that tests application and analysis, you need to have more than the ability to recall (“remember”) or discuss (“understand”) an idea. But there is good news! Bloom’s Taxonomy provides a clear metric for the knowledge you need to succeed in genetics. Because of this, you can tailor your studying. 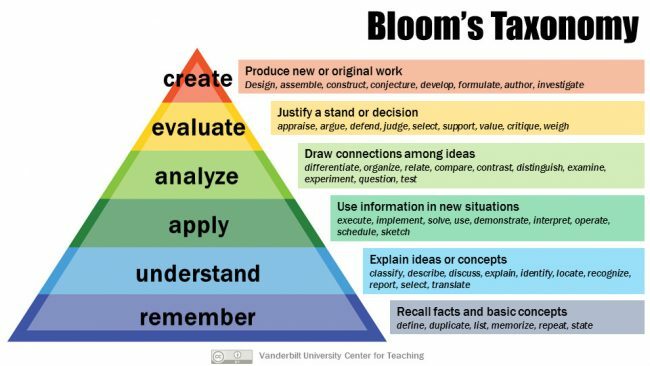 Below, I explain three genetics tips based on Bloom’s Taxonomy that are supplemented by my experience as a genetics teacher. Before emailing your professor, try debating answers with friends. This will force you to use the “evaluate” category to appraise and argue points. What does this look like? First, study the material on your own. It’s important to “remember” and “understand” before you climb to the top of the pyramid. Then, get together with a study group. Review your notes, and look for ambiguous or unclear points. Ask a question, then debate the answer with your classmates. If you can come to a consensus, that’s great! If not, email your professor or teaching aid. After receiving the answer from one of them, return to the material and discuss how the new information relates to it and clarifies it. Because genetics is often a large class, many schools will offer additional teaching support beyond the professor. If one-on-one (or small group) supplemental instruction is available, this provides an opportunity for individualized learning. Definitely take advantage of this. Try pretending like you’re the professor, and let the instructor ask you questions about the material. The instructor will know where most students lack understanding and will focus attention there. When you give your answer, you’ll be using the “evaluate” category to select and defend your response. If the only available teaching resources are the professor and other large group resources, you can practice the same activity with a fellow student. Try anticipating questions and posing them to each other. Answer, then evaluate your answer. Not only will this allow you to practice for the exam and understand the material better, you’ll learn the skills necessary to communicate medical science, which will be an asset as a doctor. Try pretending like you’re the professor, and let the instructor ask you questions about the material. The instructor will know where most students lack understanding and will focus attention there. When you give your answer, you’ll be using the “evaluate” category to select and defend your response. Ask questions and pose hypotheses. Identifying questions involves “analyzing,” as you look for relationships within the material. Formulating hypotheses utilizes the skills of the “create” category. This is not only an aid in your learning, but a great way to practice research skills. Peruse your material for areas of unclarity. Are causal mechanisms unclear? Does an intermediate step (or lack thereof) confuse you? Maybe two principles seem to contradict each other. These are real research questions, and uncovering them helps practice and demonstrate deep knowledge of the material. Further, searching for apparent inconsistencies will give you the skills to synthesize material for all sorts of biological disciplines. As an added bonus, you can ask your professor these questions, and maybe even begin researching them together! If you combine these three suggestions with other psychologically proven studying tactics, you’ll be on your way to an A in no time. Furthermore, these tips will not only help you learn the mindset of genetics, but will also pave the way for your future career as a doctor. Success is in your genes!